Letter to Mr. H.G. Hamrick from Martha Berry concerning the quails that were killed on Thanksgiving Day. Miss Berry informs Mr. Hamrick that over fifty quails were killed on the campus that day and she wants him to make sure that he puts someone on the job of going around campus on Christmas Day to make sure no quails are killed. 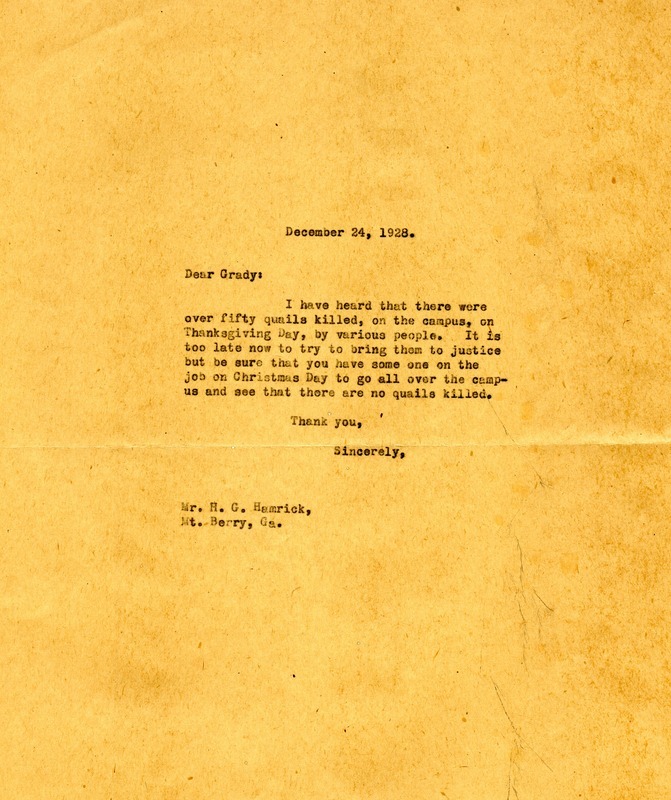 Martha Berry, “Letter to H. G. Hamrick from Martha Berry.” Martha Berry Digital Archive. Eds. Schlitz, Stephanie A., Chelsea Risley, Haley Fortune , et al. Mount Berry: Berry College, 2012. accessed April 24, 2019, https://mbda.berry.edu/items/show/7772.